colonelgrape: 92. Barnyard (a la 95 Chateau de Beaucastel), ash, wood, cassis, roasted fruit, roasted meat, hint of coffee on the nose. Dark, seductive purple and black color. 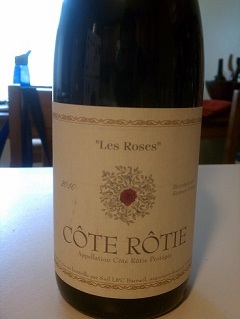 A very young Cote Rotie. Solid tannins due to it’s age but with an hour of aeration it opened up a bit but still tight. Perfect with grilled lamb chops, fatty beef or game. No brett though despite the interesting nose. A lovely long finish. Definitely a wine drinkers wine. The plethora of flavors will fall into the structure with age, I’d love to taste this again in 5-7 years. MobyGrape: 86. All right so initially I had some fantastic brie-like cheese with this wine and it just didn’t work. The cheese had a little kick to it, so did the wine, and together they just didn’t play well together. It was a totally different story with lamb chops however. 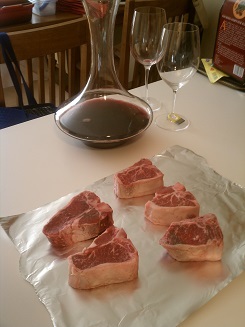 The meat did its thing, the wine did its own, and everyone was happy. It smelled pretty farty at first, eventually that turned into a subtle dirty odor, and the Colonel was spot on when he identified the taste as “barnyard”. As the night went on and without any fat from the lamb the wine got a little more sour but was balanced enough to not be annoying. Be warned – This is not a wine to drink if you’re not into wine. And by into wine I don’t mean the occasional foray into Boone’s Farm (not that there’s anything wrong with that), but you’ll be miserable wondering why you’re drinking a sour fart. If you’re a wine person though, you’ll probably enjoy this. This entry was posted in Cote Rotie, France, Rhone, Syrah on August 4, 2013 by colonelgrape.